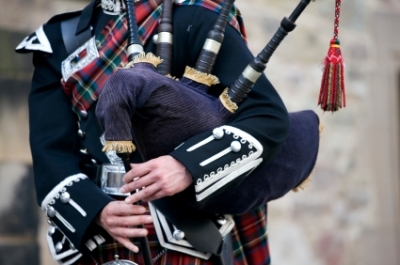 Historically, the bagpipes are thought to be first traced back to pre-medieval times, possibly as far back as 1,300BC. There are clues to their existence at these times both in texts and pictures from that time. The pipes stand in famed company in history with many believing that Nero of the Roman Empire was a fan and player of the pipes. More solid evidence of their existence appears more frequently after 1000 AD. Appearing in the UK in Pictures and texts such as The Canterbury Tales of 1380. Although examples of the actual physical bagpipes from anytime before the 18th century are extremely rare, there is a great deal of evidence of their existence in illustrations, carvings and engravings. In Ireland the bagpipes are clearly depicted in the painting of John Derrick that shows a fallen piper at a battle. In more recent history the expansion of the British army, which included Highland regiments, is thought to have brought the bagpipes to many cultures. After the two world wars the highland bagpipes became increasingly popular over the more traditional variations of the pipes of the locals. Many police and army regiments around the world have formed pipe bands featuring the bagpipes. Examples of this include police forces in Canada, New Zealand, Hong Kong, the USA and Australia. The Highland Bagpipes have also been spread through the military forces into Uganda, Pakistan, Sri Lanka and Oman. Although greatly popular the spread of the Highland bagpipes very nearly wiped out the local versions of the pipes and it is only recently that cultures have began to revive their own culturally significant variations. While we automatically associate the bagpipes with Scotland it is a little known fact that they are not exclusive to that country. The design of the bagpipes played in Scotland – and again, you may be surprised to hear that there are many different versions – may be unique to Scotland, but the history of the instrument is much older on mainland Europe than it is in the British Isles. The traditional Scottish bagpipes – the Great Highland bagpipes that are familiar to us all – have a convoluted history that is enshrined with legend. The Menzies clan claim to own the remnants of a set of pipes that were carried into battle at Bannockburn – it was customary, and still is in ceremonial terms, for a Scottish regiment to be accompanied by a piper – in 1314, although there is much controversy regards this as the first mention of such an instrument in written lore does not occur until well over a hundred years later. Bagpipes found their footing in Scotland firmly in the 1700's, and this is where the different types began to appear. Smaller than the Great Highland pipes are the Border pipes, and they also differ in not using a mouthpiece but a bellows, and just south of the border we have the Northumbrian small pipes, similar to the Border pipes, while many other types prospered in the last three hundred years. The history of bagpipes in Scotland is, however, one that is very much part of the myth and legend of this glorious country, and that there is still a tradition of pipe bands in the British Army today, as well as any number of ceremonial and traditional occasions at which pipers are required, is clear indication of just how closely the Scots value their bagpipes. If you think of bagpipes you invariably think of Scotland and tartan, but did you know that bagpipes – in many shapes and forms – were known to exist in many places in Europe long before they became associated with the highlands? As a traditional folk instrument the bagpipes have long been – and still are – a feature of many European countries, and it is no surprise that they also have a strong military link in many countries too. It is interesting to note that bagpipes are mentioned in writings in both the Roman and Greek civilisations almost 2000 years ago, and are widely believed to have been in existence in far flung places long before that, making them one of the oldest known musical instruments. The bagpipe became firmly established in many countries of Western Europe in the middle ages, with notable prosperity in the Spanish and Iberian areas, as well as France and Italy. Folk music in central Europe has long had an element of pipes involved, and many of the Balkan states also boast traditional pipe style instruments. In Italy there are still players of a pipe known as the Zampogna, a traditional folk instrument that is more akin to the Northumbrian small pipes than to the Great Highland pipes we know so well, and in France the Musette is a popular form of pipe played to this day and known to have been around for several hundred years. As the popularity of bagpipes spread across the European continent it eventually found its way to the British Isles, and while Scotland is considered by many to be the traditional home of the characteristic droning instruments one suspect there are many other claimants over the channel.